10 best cookie dough flavors, that you sell for $16-$17 each, packaged in a 2.7 lb tub. #1 Seller, 10 years straight! The quality of this cookie dough is exceptional – your supporters will love it. One Look and They’re Sold! 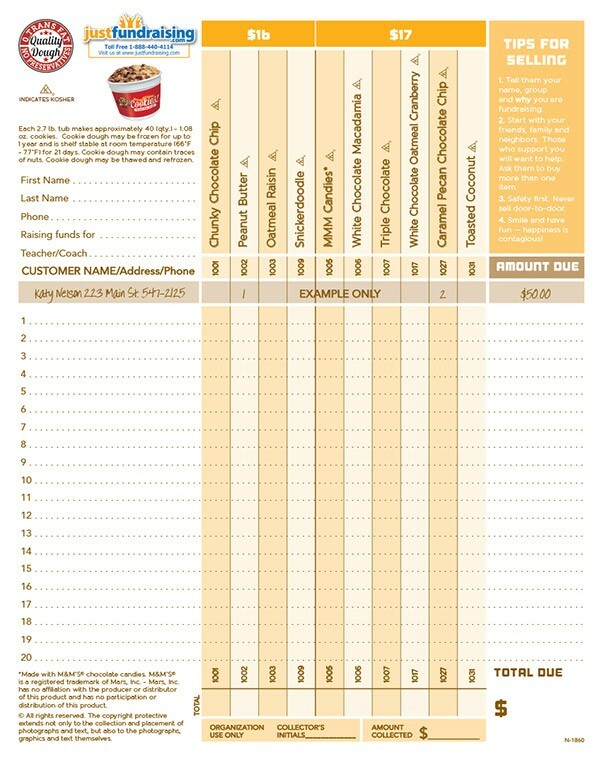 The Crazy About Cookie Dough fundraising program is our #1 selling cookie dough fundraiser. 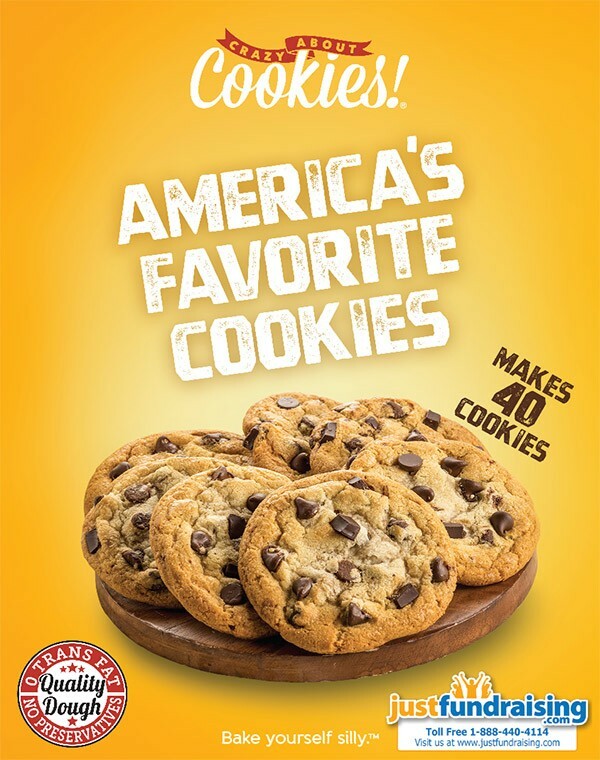 It offers 10 of our best-selling cookie dough flavors. It's perfect for groups that have 15 or more participants. You get free shipping once you’ve sold 150 units or more! 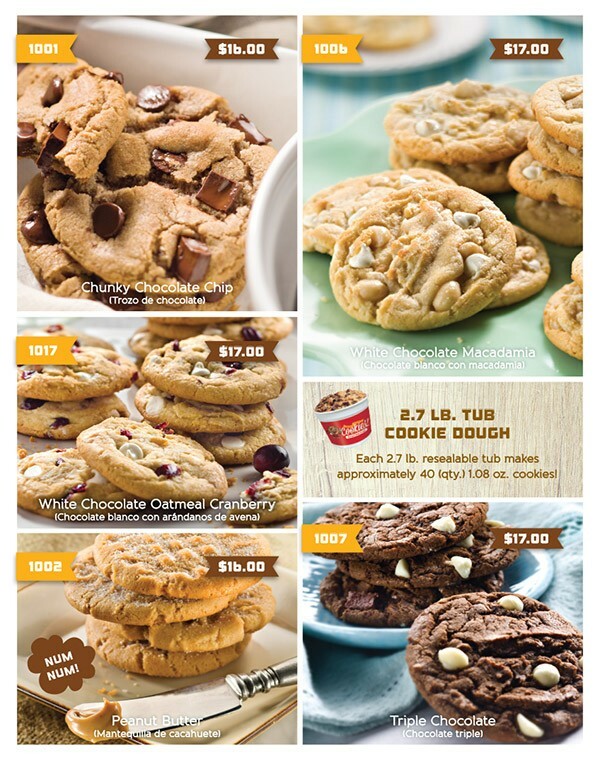 The Order-Taker features beautiful product photos, allowing the cookie dough to virtually sell itself. Are you ready to start your best fundraiser ever? Quality & Convenience:Cookie Dough may be frozen up to 1 year, has a shelf-life of 21 days at room temperature. The product can be thawed and re-frozen. It can remain in the fridge for up 6 months. Zero Trans Fat, Kosher Product. May contain traces of nuts. FREE to Start: The Crazy About Cookie Dough fundraising program costs absolutely nothing to get started. Simply let us know how many fundraising participants you have and we’ll send 1 order-taker for each of them, at no charge. Reach Your Fundraising Goal: Your profit varies from 30% up to 55%! Smaller groups can aim to sell at least 336 tubs, which is at the 40% profit level, for earnings of over $1,700 profit. Larger groups can aim for the 55% mark. Priced To Sell: Only $16-$17 for a 2.7 lb tub that makes about 40 - 1.08 oz cookies. Simply scoop and bake! Free Shipping and Low Minimums: Your group receives Free Shipping when you sell 150 items or more, easily attainable by even a small group of 15 participants (only 10 items each!). And our minimum order is only 84 items! Distribution day made easy : It can be kept at room temperature (66-77 degrees) for up to 21 days before being refrigerated again. So no need to have parents and volunteers rush in to collect their cookie dough during a tight 2-hour time window. Your Group Keeps Up To 55% Profit! The amounts in the Profit Chart is including any shipping costs. How Does the Crazy About Cookie Dough Fundraiser Work? 1. 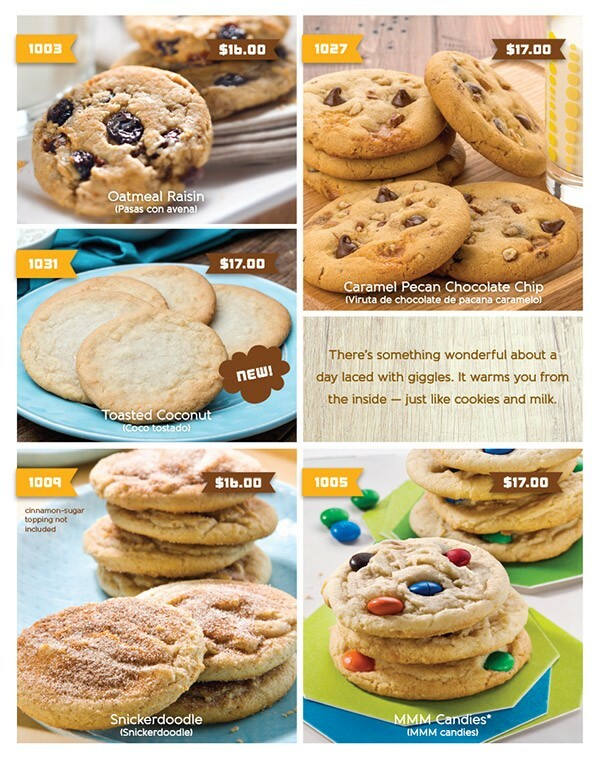 Order 1 Crazy About Cookie Dough order-taker PER fundraising participant – they’re FREE of charge! 2. Have your group members show the order-taker to friends, family, neighbors, and or co-workers and invite them to purchase 1 or more tubs of cookie dough. (Note: Your participants will collect the funds up-front, and will take note of their supporter’s name and mailing address on the order form included). 3. Collect all of the order-takers and all funds raised from your group members, at the end of your fundraiser. 4. Place your product order with us by completing and submitting the Order Form by fax. 5. Count your profits – your group pays only the cost of the product and keeps everything else. 6. JustFundraising.com will ship the entire order to you, so your group can distribute the products to your supporters. Please ensure that no minor goes fundraising door-to-door alone. If they choose to go door-to-door, they need to be in two’s or three’s, and or with a parent. Shipping to remote areas... or "off-the-beaten-path" sections of the Western states such as Utah, Wyoming, Oregon, Idaho, etc may not be possible. Please call us for details. Pack-to-the-case means that we will round up each flavor to a multiple of 6. Example 1: if you order 3 items of a given flavor, we will round it up to 6 items. Example 2: If you order 21 items of a given flavor, we will round it up to 24 items. Who pays for these extra items? The cost of these extra items is charged to your group. Don't forget - selling these items will make even more profit for your group. Top Reasons Why Pack-to-the-Case is Perfect for Your Group! More Profit: It's a great way to make extra profit and after all this is your fundraiser! Simply sell them to your supporters- many will want a 2nd or 3rd item, especially once they've tried it! There will be others that can still be approached. If you want, you can sell them quickly by offering them at a fire-sale price i.e. only $10 each! Less Hassle: Groups often end up being short several items because a few fundraising participants turned in their order late or forgot to, all together. The extra items you receive with your pack-to-the-case order will help you cover that shortage. This will help avoid the very expensive costs of refrigerated shipping for the items that you were short. This was my first time using JustFundraising for my fundraising needs. Our small group was able to raise almost $1000 to pay towards a trip to the Galapagos! The instructions were very clear and the representatives were able to help every time I called with a question. I would recommend JustFundraising to colleagues without reservation for their fundraising needs. Our PTA raised over $1,500 profit with this fundraiser. We can't wait to get the cookies! We're a small daycare that used this fundraiser for new playground equipment. It went much better than we expected, we raised over $1,400 profit! Our boys reached our goal of $1,000 profit to pay for our out-of-state tournament. Thanks JustFundraising. Our cookie dough fundraiser was so easy. We had not fundraised in several years, so we didn't know what to expect. We were hoping to raise $4,000 profit, and we ended up earning over $8,500 profit - it was an incredible success! We had 123 students participate out of about 325 students. We set-up prizes to motivate our students. If they sold 3 tubs, they'd receive one prize like putty or a stuffed toy; the top seller receives $50 cash prize and the top selling class gets a free pizza party. This was enough to get them excited and to ask for their parent's support to sell the cookie dough. This was our first time trying this fundraiser and we were very happy with the result! Our daycare ended up making over $2,800 profit which will help pay for various improvements to our playground. Our gymnastics team only had 10 sellers but we ended up raising over $3,000 profit! The money will help pay for our competition fees. Our dance school has been using this fundraiser each Fall for the past 7 years and it has always worked great. This year we raised over $33,000 with only 100 members participating. There was even a Baseball team in our town that was selling cookie dough from another company, but it didn't taste as good. So I referred them to JustFundraising for their next cookie dough fundraiser. Our cheer group ended up raising over $2,000 in profit. Only 19 families participated and each member was able to raise a couple hundred dollars for their individual account. Our group was raising money for security locks for our classrooms. Although the group participation was a little low, we still raised over $1,400 profit! Our group raised over $1,000 in profit to help pay for a trip to six flags! We are using our profits for new uniforms for our girls softball team. New Jersey, pants,and socks. Our pre-school raised over $800 with just 15 sellers. We offered a pizza party to our group members as an incentive for participating in the fundraiser and for meeting our sales goal. Our handbell choir was raising money for new music stands which cost a little over $50 each. We ended up raising over $700 in profit with a group of only 8 sellers! My husband works as a county official and brough a brochure to work which helped get us some extra sales. Our fundraiser was amazing! Our customers absolutely loved the colored brochures, the images of each flavor made everything an easy sell. We had a group of 50 sellers that were raising money for their sorority dues. We ended up raising over $1,300 in profit. We used social media to promote the fundraiser and also offered a starbucks gift card to the best seller. Our sports club was raising money for a new scoreboard. We ended up raising over $1,000 in profit which is exactly what we were aiming for! We had about of 50 sellers participate. To promote the fundraiser we sent letters home and also offered a gift card to the best seller. Our fundraiser went very well. We raised over $800 in profit with a group of only 5 sellers. The money raised is for a service mission trip to Saint Lucia to help people with developmental challenges. We raised over $1100 for our 8th Grade DC Trip selling cookie dough. Easiest fundraiser ever. We were raising money for our band and ended up raising more than we did in previous years. Even though we didn’t have full participation, we still ended up raising over $2,500 in profit. We had another success with your cookie dough. I'm glad we did the $15 tubs instead of $10 tubs because the kids found them very easy to sell at $15, so if we sold the $10 we would have made less money. Thank you, have a good day. "Our fundraiser went very well. We ended up raising alot more than expected, even more than we did last year. The cookie dough is great, we like that it does not need to be refrigerated immediately which makes it easy to store and distribute to our group. The brochure is also very visually attractive and makes it easy to sell." Successful fundraiser with Cookie Dough and managed to Successful fundraiser with Cookie Dough and managed to raise over $2000..
We sold 333 units of cookie dough and raised a profit of $1300. We are very pleased with the program! "I was impressed with the Cookie Dough Fundraiser, and their employees, who were there to help every step of the way - Hats off to you all and your company. What a terrific fundraiser with fabulous flavored doughs to sooth your sweet tooth. Our goal was to raise money and awareness for Autism; My nephew was diagnosed with Autism as well as many other children in the Unites States who have been affected by this puzzling disorder. Our profit will go towards Autism Speaks to help find a cure for Autism. My team players were very excited about this fundraiser, and how well the community responded and supported us by buying cookie dough, for this great cause. Thanks to everyone!" My cheer team was looking to do a cookie dough fundraiser that was a little different than what the other schools were doing and this was definitely the best one. Having so many different things to choose from helped us raise money quicker than we expected and made our fundraiser a huge success. All the different items definitely helped this fundraiser become a real success. We looked around at a few different companies and the nice variety and the fact that there is no up-front cost is what made us choose justfundraising. The reps were very polite and helpful and everything was done in a timely fashion. This is a great, low maintenance / high reward way to raise funds for our team. We have been able to get equipment & travel to competitions that we would be without if it weren't for the cookies! Delivery man was prompt and extremely helpful and very nice. He called us when he was 20 minutes away and told us when he would arrived. Very happy. Will be doing another fundraiser soon.Very satisfied the Crazy about cookies fundraiser it ran smooth and the delivery of the product was quick. Very pleased. We have done the cookie dough fundraiser for several years now. Each year your company seems to have gotten more organized and streamlined. I am very happy with the improvements!